« A Read of The Girl’s Own Annual (1907-1908) and an Inadvertent Critique of Goodnight Stories for Rebel Girls (2016). The combination of eggplant, zucchini, mushrooms and spinach is very healthy and wonderfully hearty, especially when combined with a carbohydrate like pasta, and topped with melted, gooey cheese. The savoury goodness is likely to convert (or at least subvert) most people who claim they do not like eggplant, or zucchini, or mushrooms, or even spinach, because they merge into a rich flavour that amounts to much more than its separate parts. This dish is a little labour intensive to prepare, but is worth it for a weekend dinner or gathering. It is worth making the tomato sauce from scratch because the flavour is richer, and there are no preservatives and less sodium to contend with (it also takes less than five minutes to prepare). Stirring garlic and (lemon) thyme with olive oil and frying it before mixing it into the vegetables adds depth to the dish. I do save work by using a small jar of commercial tomato pesto sauce (President’s Choice Splendido tomato pesto is excellent, and widely available at Toronto-area No Frills grocery stores, and probably further afield as well; in the winter I use it as a base for quite a few pasta dishes — and suspect I’m not the only one, because in the middle of the winter it tends to sell out quickly). And I never salt and drain eggplant as many recipes suggest, allegedly to reduce bitterness. I’ve read it is not necessary to do so with most eggplants, and mine have never turned out the slightest bit bitter. I also don’t peel eggplant (or zucchini, or pretty much anything else); most of the time, I think doing so is unnecessary and wastes nutrients (and fibre, for those so concerned). This dish had its origins in a vegetable lasagna recipe published in The Complete Vegetarian Cookbook (by America’s Test Kitchen, 2015). The original recipe included squash, which I love in almost any form but do not find works well in a lasagna or pasta dish. One weekend day last winter I had a craving for eggplant and spinach, and decided to use the original recipe as a base for invention. 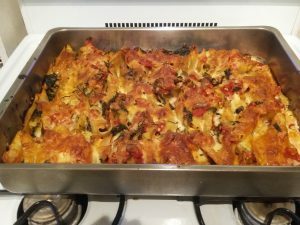 I used conchiglie because I am not a huge fan of lasagna noodles and because my first experiment with cannelloni ended in frustration (those things are hard to stuff!). Two things I’ve retained are the tomato sauce recipe, which is excellent, and the suggestion to mix garlic and thyme with oil to saute and then stir in with the softened cooked vegetables. In the colder months I make this dish at least once every couple of weeks. It’s wonderful at the end of a cold day, and I don’t think anyone who has tried it has not loved it. 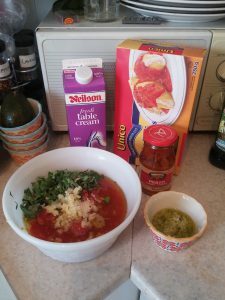 In a medium-sized mixing bowl, stir together canned diced tomatoes (crushed tomatoes work well, too), fresh basil (and/or other fresh or dried herbs, such as tarragon), 2 to 3 cloves of crushed garlic, olive oil, salt, and red pepper flakes. Set aside. In a small dish, mix together olive oil, 2 to 3 cloves of crushed garlic, and thyme or lemon thyme. Set aside. In a large pot filled with water, boil conchiglie until cooked al dente, about eight minutes. Drain and set aside to cool. Chop eggplant, zucchini, mushrooms, and onion. Saute together in olive oil in a large skillet at medium heat until softened and cooked, about ten minutes. Open up a space in the middle of the skillet, and pour in olive oil infused with garlic and (lemon) thyme. Heat mixture until garlic is softened and oil is aromatic, about one minute. Stir together vegetables with garlic mixture. Stir in pesto sauce. Stir in spinach until wilted. Add salt and pepper to taste. Remove from heat. Into a large, shallow baking dish (a lasagna pan works well), pour 1 to 2 cups of tomato sauce. Pour in 1 cup of table cream or milk and stir together with the tomato sauce. With a spoon, fill each conchiglio (jumbo pasta shell) with some of the eggplant vegetable mixture and set in a single layer into the baking dish, open side up. A full package of conchiglie (jumbo shells) filled with the vegetable mixture should approximately fill a typical lasagna dish. Dot shells with remaining tomato sauce, and top with shredded mozzarella (and/or cheddar and/or Parmesan cheese). Add salt and pepper to taste. Top with additional herbs (fresh basil, lemon thyme, tarragon) if desired. Bake in oven at 400 degrees until cheese is melted and dish is bubbling, 25 to 40 minutes. Cool and serve.